Preface. Scale Effects and Transitional Failure Phenomena of Reinforced Concrete Beams in Flexure (A. Carpinteri et al.). Fracture Mechanical Prediction of Transitional Failure and Strength of Singly-Reinforced Beams (D. Lange-Kornbak, B.L. Karihaloo). Size Effect and Bond-Slip Dependence of Lightly Reinforced Concrete Beams (G. Ruiz et al.). Behaviour of R/C Elements in Bending and Tension: The Problem of Minimum Reinforcement Ratio (A.P. Fantilli et al.). Size Effects on the Bending Behaviour of Reinforced Concrete Beams (R. Brincker et al.). Minimum Reinforcement Requirement for RC Beams (J. Ozbolt, M. Bruckner). The ESIS-Technical Committee 9 on Concrete was established in 1990 and has met seven times. A proposal was put to European and extra-European laboratories entitled "Scale effects and transitional failure phenomena of reinforced concrete beams in flexure" which lead to several positive responses. The central topic discussed by the committee was that of the minimum reinforcement in concrete members. The minimum amount of reinforcement is defined as that for which "peak load at first concrete cracking" and "ultimate load after steel yielding" are equal. In this way, any brittle behaviour is avoided as well as any localized failure, if the member is not over-reinforced. In other words, there is a reinforcement percentage range, depending on the size-scale, within which the plastic limit analysis may be applied with its static and kinematic theorems. 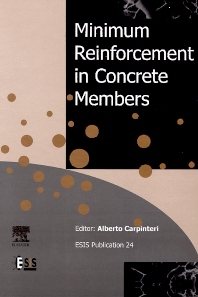 Carpinteri, Ferro, Bosco and El-Katieb propose a LEFM model, according to which reinforcement reactions are applied directly on the crack surfaces and a compatibility condition is locally imposed on the crack opening displacement in correspondence with the reinforcement. The theoretical model is found to provide a satisfactory estimate of the minimum percentage of reinforcement that depends on the scale and enables the element in flexure to prevent brittle failure. For mechanical engineers and scientists with an interest in concrete reinforcement.